Free flow, spring water ice cubes. Each ice cube is individually produced allowing for extra clarity of the ice and consistently sized cubes. 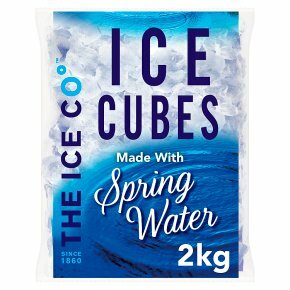 Natural spring water ice cubes made with Blue Keld Spring Water. Dating back to Nordic times, Keld is the Viking word for spring and Blue Keld, as appears on historic maps, has been refreshing for centuries. Handling Instructions These ice cubes are 'free fun'. Should they have stuck together during storage, a short drop onto a hard surface should separate them.